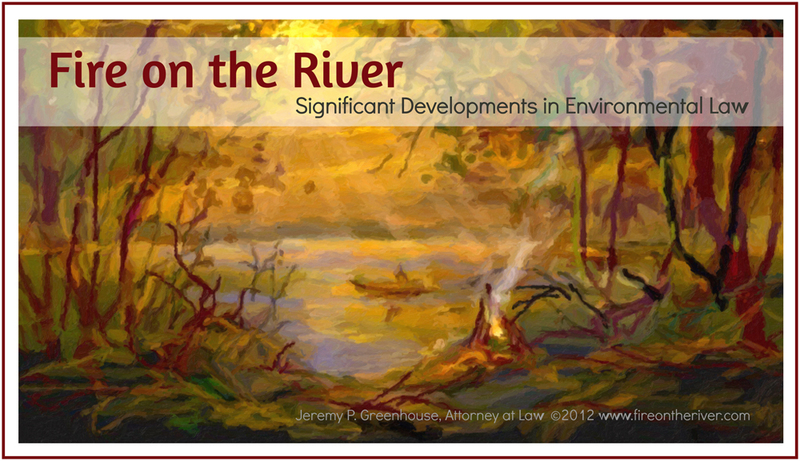 U.S. Supreme Court Rejects EPA Mercury and Air Toxics Standards for Power Plants | Fire on the River! On June 29, 2015, the United States Supreme Court held that the U.S. Environmental Protection Agency (EPA) acted unreasonably when it deemed cost irrelevant to the decision to regulate emissions of mercury and other hazardous air pollutants (HAPs) from power plants under the Mercury and Air Toxics Standards (MATS). Michigan v. E.P.A., 135 S. Ct. 2699 (2015). The MATS, which is now on remand to EPA, is one of the Obama administration’s signature environmental rulemakings. After conducting the required study, EPA found that regulation of power plants under section 112 was both appropriate and necessary. EPA’s regulatory analysis estimated that the regulation would cost power plants $9.6 billion per year with corresponding benefits of only $4 to $6 million. However, EPA determined the costs and benefits were not relevant to the initial decision of whether or not to regulate power plants under the MATS. Justice Scalia, writing for a five-justice majority, disagreed. Even under the deferential standard adopted in Chevron U. S. A. Inc. v. Natural Resources Defense Council, Inc., 467 U. S. 837 (1984)—which directs courts to accept an agency’s reasonable resolution of an ambiguity in a statute that the agency administers—EPA could not reasonably interpret the “appropriate and necessary” standard in this context as requiring no consideration of costs and benefits. In a dissent joined by Justices Ginsburg, Breyer, and Sotomayor, Justice Kagan argued that although EPA had not considered costs in its initial decision to regulate power plants, EPA subsequently considered costs in great detail when categorizing and setting emissions limits for power plants, identifying $80 billion in quantifiable benefits of the rule. Assuming EPA can apply this cost data on remand to meet the “appropriate and necessary” standard, the substance of EPA’s rule is likely to remain intact. The more lasting impact of this case may come from Justice Thomas’ concurring opinion, in which he called into question the validity of the longstanding Chevron doctrine. By allowing agencies to determine the meaning of ambiguous statutes, Thomas argued, the doctrine vests legislative power in the executive branch. Moreover, by requiring courts to acquiesce to agency interpretations of these statutes, Thomas claimed, the doctrine undermines the judicial branch’s ultimate interpretive authority.